Designed to soften the hooves too hard and stabilize the water balance of the hoof. 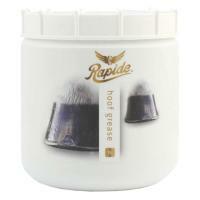 Keeps hoof elastic and fights the jagged wall of the sole and also enhance the growth of the hoof. Regular use of the product gives the hoof looks nice and shiny. Readily penetrates into the socket and its profound action is visible even after many hours of application. Clean the base with a sharp hard and if necessary with water, let dry and apply the grease clogs with a brush on the crown and across the base, up and down. natural mixture of mineral oils, greases, petroleum jelly and laurel.